Pear Tree Farm is a traditionally built four-star guest house open to both participating art students as well as guests visiting on a Bed and Breakfast arrangment. In addition the entire guest house can be hired as a holiday rental. 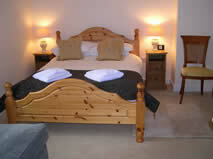 We have nine bedrooms (4 doubles, 3 twins and 2 family rooms) all individually styled with original artwork. All rooms are en-suite as well as having private access to the guest lounge and dining room. Our rooms are equiped with T.V & video player, towels, alarm clocks, hairdryer and drinks tray provided. Two rooms are located on the ground floor and are suitable for wheelchair access. If you require one of these rooms please let us know at the time of booking. Please view our Layout & photo section to see all 9 rooms. 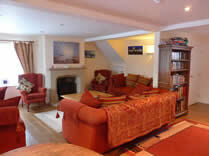 Our spacious guest lounge has a lovely wood burning stove, large TV, Video & DVD player and is the perfect place to relax. There is a range of books and magazines made available to guests for the duration of their stay. 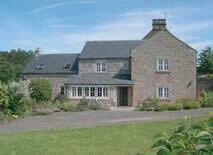 Pear Tree Farm is fully licensed to serve a selection of wines, beers and spirits. For the summer, we have a patio area with tables & chairs as well as a gazebo and BBQ facilities by arrangement. Our renowned traditional English breakfast is made from many locally sourced ingredients with our bacon and sausages coming direct from the highly renowned village butchers.Our continental breakfast includes a selection of bread, a choice of jam, yoghurts, cheeses, fruit salad and cereals.This of course is complimented by a choice of fruit juices, ground filtered coffee and tea selection. All our eggs are free range and we do our utmost to support local farming businesses. Meals are served in our charming guest dining room surrounded by local works of art. All our rooms have free code-accessed WiFi. We have a large area off-road car park adjacent to the Guest House and disabled parking closer to the entrance. At Pear Tree Farm we recycle glass, plastic, tins and paper/card. It is possible to hire the whole property as rental accommodation. Guests will have full use of all rooms and our kitchen facilities. Our kitchen area includes double-oven range cooker, large fridge and freezer, microwave, and all crockery, pans and cutlery. Groceries can be ordered on-line for self catering groups from Tesco at Alfreton (who deliver). Please enquire for further details, room plan and availability. If you are a group and wish to use the art studio which overlooks Lea Brook, please ask when booking if this is available (at an extra cost). The Art Studio is a 20 ft x 30 ft wood building with tables and chairs (seats 15 people with own "fold away" table), drinks facilities, fridge and has its own toilet.